Hesh Amla Powder Very sorry - this item is currently out of stock. Hesh Heenara Powder Very sorry - this item is currently out of stock. Hesh Lemon Peel Powder Very sorry - this item is currently out of stock. Hesh Maka Powder Very sorry - this item is currently out of stock. Hesh Neem Leaves Very sorry - this item is currently out of stock. 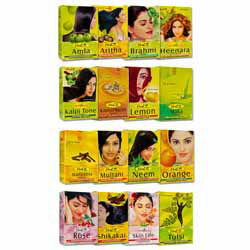 Pamper your skin and hair with this collection of 16 natural powders by Hesh. "Dear Spices of India, I know others have said it, but I couldn't believe that an order I placed on the internet arrived the next morning! Fantastic service, many thanks"